The Portland Trailblazers' No. 1 pick in the 1974 Draft impacted the league as soon as he suited up for his first pro game. He would average 12.8 points and 12.6 rebounds in his rookie season but was held to playing in 35 games due to various injuries. It wasn't until the 1976-77 season the Trailblazers got a return on their investment. Big Red averaged a career best in points (18.6) rebounds (14.4) and blocks (3.2) per game for the season, as well as his first All-Star selection. He continued his dominance during their playoff run that year, bumping his rebound total up to 15 per game. 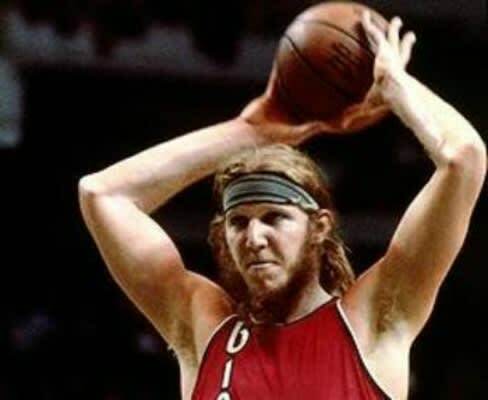 The Blazers went on to win the championship that year, and Walton was awarded Finals MVP honors. Despite breaking his foot the following season, The "Big Red-Head" went on to win the regular season MVP award after posting 18.9 points, 13.2 rebounds, five assists, and 2.5 blocks per game, but this was the start of terrible foot injuries for Walton. After missing the entire 1980-81 season due to another foot injury, and several other surgeries to his feet, Walton was not able to play at that MVP level again. He ame off the bench for the Boston Celtics in 1986, winning Sixth Man of the Year and another championship before retiring in 1990.